Call 211 on your cell phone or visit 211 Washington Resource Network or 211info.org to find Extreme Cold Weather Shelters in our area. Lower Columbia College and the Kelso School District are partnering to add a larger Headstart facility at Barnes Elementary School, 401 Barnes Street, Kelso. The new modular will be approximately 5,000 square feet in size and have an additional 14 off street parking spaces as well as an off street drop off and pick up for the kids. Parties wishing to comment on the Notice of Application or Environmental Checklist must do so in writing by 4:30pm December 6, 2018. Please follow the directions within in the Notice of Application on how to submit comments. Only written comments can be taken. For more information visit Current Development Projects on our Planning Webpage. Tonight, starting at 7 pm, crews from SPM will be striping Grade Street from Oak Street to 13th Street. The striping will be in a new configuration from the current striping. Between Ash Street and 13th, the new striping will designate one through lane each direction, a center-turn lane and bike lanes on each side. From Oak to Ash, the new striping will designate one through lane in each direction and bike lanes on each side. During the work, individual lanes will be closed until the striping dries, but Grade Street will remain open. In addition, striping to Oak Street from 4th to 5th, 4th from Academy to Oak and 5th from Oak to Allen will occur in upcoming days as weather allows. The City will work to minimize any inconveniences. We appreciate your cooperation and patience. 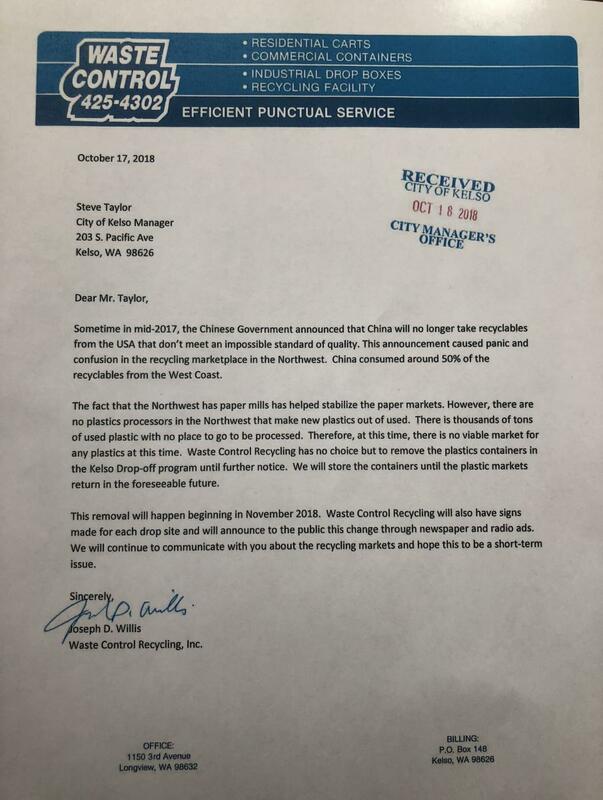 Please note the removal of plastic containers beginning November 1, 2018 at the Kelso recycling locations. In accordance with RCW 35.21.157, notice is hereby given that the City of Kelso is proposing a rate adjustment in its solid waste handling fees for consideration by Council on November 6, 2018. Said fees will be effective January 1, 2019. The following presentation was delivered by City Manager Steve Taylor at the Kelso-Longview Chamber of Commerce Quarterly Luncheon held today.